Have you had a chance to come out and see our newest planetarium show, 2012:Mayan Prophecies? If so, you’ve enjoyed a fascinating glimpse into an ancient culture known for its astronomy. The Dresden Codex features tables of eclipses, full and new moons, as well as the times of solstices and equinoxes. Conjunctions (close alignments of planets in the sky) are noted, as are the times when each planet rises just before or just after the sun. The Codex devotes six pages to measurements of the positions of Venus. The emphasis on Venus, or Chak Ek’ to the Maya, distinguishes ancient Maya astronomy from that practiced by other ancient cultures. Of course, people in civilisations all over the world noticed Venus, which outshines everything in the sky except the sun and the moon. However, other cultures did not consider cycles of Venus as important for time keeping. Let’s look at how Maya astronomers could use Venus as a marker of time. First, some basic facts about Venus and its orbit. Venus is the second planet from the sun; Earth is the third. As result, Venus’ orbit is completely inside Earth’s and we see the whole orbit in ‘front’ of us, so to speak. As of May 2011, Venus is in the morning sky, where it has been since November 2010. This means that for the past six months, Venus has been ahead of us on its faster, inner, orbit. However, we’ll soon see Venus pass around the far side of the sun, making it invisible to us for about a month and a half this summer. By fall 2011, Venus will have emerged from behind the sun, such that it appears to the sun’s left in our sky. This makes Venus an evening star, appearing over the western horizon at dusk. Venus remains an evening star through spring 2012, while it gradually catches back up to Earth, coming back around to our side of the sun. On June 5, 2012, Venus catches back up to us and ‘laps’ the Earth on its faster orbit. Thus we’ll see Venus quickly drop out of the evening sky in late May and reappear in the morning sky by mid-June. Venus then remains in the morning sky until it heads around the far side of the sun by March 2013, and the process repeats. Global radar view of Venus. One Venus cycle, as described above, takes 584 days. Also, as it turns out, Venus completes 13 orbits around the sun in almost exactly eight years. On a given date in 2011, for example, Venus is where it was in the sky on the same date in 2003, within two days. These facts enabled the Maya to keep a regular calendar of Venus’ appearances. For the Maya, each Venus cycle began with Venus’ entry into morning sky, rising just before the sun. Called the heliacal rising of Venus, this is the moment when Venus is on our side of the sun, having just ‘lapped’ Earth and pulled ahead on its faster orbit. Maya astronomers also noted Venus’ emergence into the evening sky, but considered that less significant. After all, Venus becomes an evening star only gradually, taking over a month to emerge from the sun’s glare. It is also dimmer than average at this time because it is on the far side of the sun from us. On the other hand, Venus enters the morning sky quite quickly and dramatically, appearing noticeably higher each morning for several days. And since Venus is closest to us at that time, it is also brighter than average. Upon observing a heliacal rising, Maya astronomers knew the next would occur 584 days later. And they knew to expect another such rising of Venus during the same season about eight years later. Due to its brillance, cultures around the Mediterranean associated Venus with love and beauty. That’s why Venus is the only planet named after a goddess. 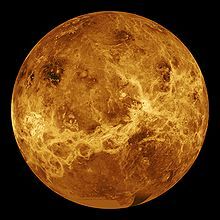 At one time, the Greeks distinguished the evening star Hesperus (Latin ‘Vesper’) from the morning star Phosphorus (Latin ‘Lucifer’), but they were both names for Venus. Maya also distinguished the evening star (Lamat) from the morning star (Ah-Chicum-Ek’). For the Maya, either appearance of Venus was a harbinger of evil–particularly the morning star. This made Venus’ sudden appearance at dawn a good omen for someone wishing to wreak destruction. Accordingly, Maya often scheduled attacks on rival cities to coincide with the heliacal rising of Venus. One such attack, which the Maya called a ‘Star War,’ is depicted in our show. If you want to observe Venus today (May 2011), you need to rise before dawn and face east. An interesting gathering of four planets, in progress for much of the month, still continues. As I write this, Venus and Mercury have passed Jupiter and are approaching Mars. Venus and Jupiter are about eight degrees apart with Venus to the lower left. They far outshine everything else but the sun and the moon, so those two planets are easily noticeable well into twilight. Mars and Mercury appear to either side of Venus and are much dimmer. Right now, Mercury is to the lower right of Venus with Mars to the right and a bit above Venus. Today, Venus is within one degree of Mars. Mars is above Venus, Mercury below. The alignment of Mercury, Venus, and Mars was closest on the morning of May 21. After this, Mercury quickly exits the scene while Venus gets lower and lower in the pre-dawn sky throughout June, until it is lost inthe sun’s glare by July. 2012, however, offers some spectacular views of Venus. In spring 2012, Venus appears as high as possible in the evening sky (as it did in 2004 and will do again in 2020). That particular evening apparirion ends June 5, 2012, as Venus aligns so well with the Earth and sun that it appears as a dot on the sun’s disk. That transit of Venus will be the last such event in the lifetime of anyone alive today. Hopefully, none of this will be taken as a sign to sacrifice or invade others.